Josh and Emily are in the Spotless Summer Zone, which means they have no game objectives. So, they summon the Messenger to take over the jukebox while they get to know the amenities. Join them on a pool chair, as they witness a moshpit of the undead, a hockey game played by ninjas, and a coworker finding the secret to immortality. Then, hold onto your seats as Emily updates us on her Summer Games Challenge. Order a smoothie, or pick its fruit--relaxation is the name of the game on this episode of the VGM Jukebox. Very nice. This spotless summer has all the good vibes. My hat is off to the Messenger for an excellent group of selections. I did suffer a little whiplash fron the transition from Game & Watch Gallery to Killer Instinct, but I enjoyed every selection. 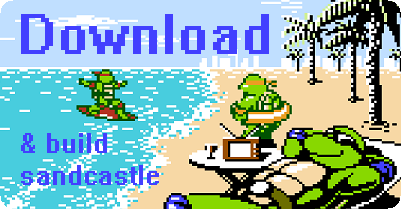 Also, that TMNT graphic on the download button is giving me warm fuzzies.